Please contact me regarding the 2018 Sure-Trac STEEL HIGH SIDE - Stock# 211192 for sale at TruckerToTrucker.com. 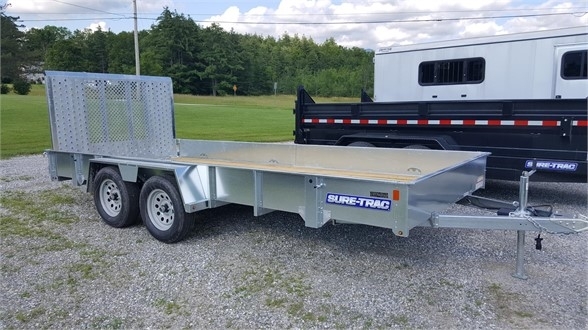 Take a look at this 2018 Sure-Trac STEEL HIGH SIDE. It is Stock# 211192 at TruckerToTrucker.com. STANDARD FEATURES: 2 x 6 Pressure Treated Decking 14 High Solid Sides with 4 Tie-Down Rail 7K Units have one brake axle standard Gusseted Corners Wiring Enclosed in Tubular Steel Powder Coat Finish Self-Retained Gate Pins Fold Flat/Spring Assist Gate Safety Chain Holders EZ Lube Hubs Reinforced Set Back Jack Board Retainers Front and Rear Rubber Mounted LED Sealed Lights EverLink    - High Performance Wiring Harness G.V.W.R. 7000 LBS CALL FOR MORE INFORMATION AND PRICING TODAY!